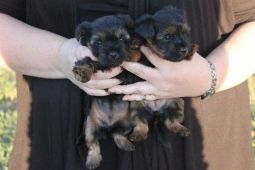 Australian Silky Terrier breeders links and breed information on pups4sale.com.au. A spirited blend of the Yorkshire Terrier and the Australian Terrier…and the best of both. A dog-lover couldn’t ask for more than such a loyal, inquisitive, intelligent companion as the Australian Silky Terrier! 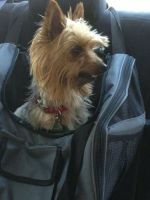 Thanks to Pondaroza Australian Silky Terriers for the images used on this page. History – In the late 1800s, the Yorkshire Terrier was brought from England to Victoria and New South Wales, Australia, and bred with the already very popular Australian Terrier (some think, in hopes to create a better textured coat in the Australian Terrier). The only problem was, some litters could produce not just one or two but all three distinct breeds! Some were obviously Yorkies, and some were obviously Aussie Terriers…but this new third breed, the Silkys, seemed to be a perfect in-between of the two. 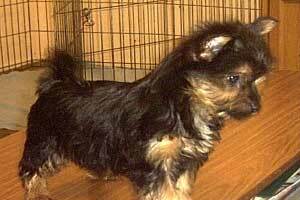 Soon thereafter, the Silky Terriers began to be bred together, and a new, beautiful dog breed was born. However, the two groups developing simultaneously in New South Wales and Victoria also came up with two separate breed standards, one in 1906 and one in 1909. There were some very definite differences, but overall, it seemed the only real point of contention between the two standards was the acceptable weight. Finally, in 1926, a compromise was reached between the two groups of dogs and a revised standard was accepted by all. Oddly enough, the last real change to be made with the breed was the name. For the first 50 or so years, this pup was actually known as the Sydney Silky Terrier! This Australian Silky Terrier became the Australian Silky Terrier in 1955. 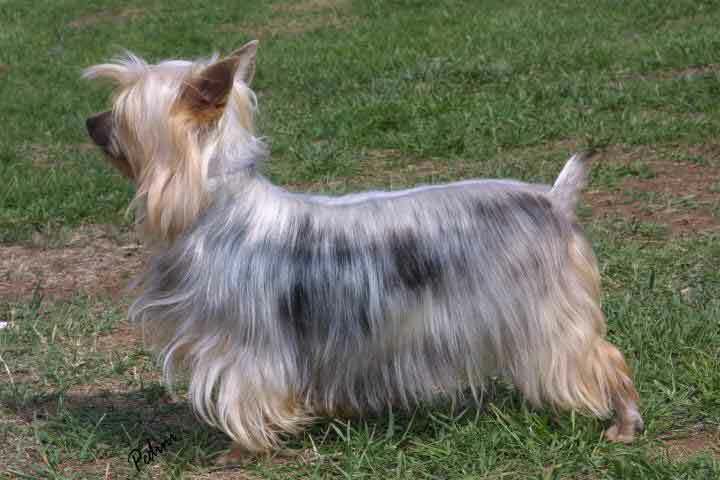 That same year, the breed was recognized by the AKC in North America (though it is referred to mainly as the “Silky Terrier”). Breed Standards – The size of the breed makes it an ideal travel companion, and a perfect dog for small spaces. Average size of males is 25cm/10,” whereas females are a tad smaller at 23cm/9." Average weight of adult Silky Terriers ranges between 4-5kg/8.5-11lbs. While this breed may not have the widest ranging of coat colours, the main colours of blue, or blue and tan, are lovely. In terms of show standards, the more clearly defined the blue and tan colour, the better. Though a lighter silver colour can occur in the coats, it is not acceptable in the show ring. Black colouring is commonly seen only in puppies, with the other colours usually coming in by 18 months of age. The single layer coat is very silky in texture (hence the name of the breed). Other characteristics typical for the Silky Terrier are dark, soulful, almond-shaped eyes, a wedge-shaped head, and attentive V-shaped ears set high on top of the head. 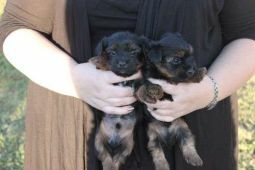 These are stout, muscular little dogs, whose length slightly exceeds their height, and the tail (in terms of the show ring) is preferably docked. Your local breeder can help you further explore the standards. Energy – If you’re looking for a passive, doe-eyed little lap dog…well, you best keep looking. The Australian Silky Terrier is a Terrier, after all! 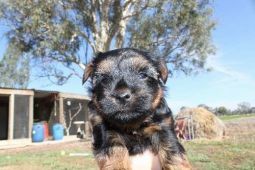 As with most other small terrier breeds, the Australian Silky was used in hunting rodents, and they have kept that keen sense of alertness and intelligence to this very day. This breed is well-suited for apartment living, provided that they get a healthy dose of walk-time and play-time each day (mainly to help avoid Small Dog Syndrome). Keep your pup on a leash, though; remember, they are hunters by nature…and fast as a greased bullet if they spot something that catches their ever-watching eye! They are always up for an adventure (or a bit of mischief), so try to stay one step ahead of them (literally and figuratively) when out walking. Temperament – Always on the move, always ready to play, and sometimes a bit pig-headed and defiant, these dogs are known to be very attentive and most definitely trainable (though they may “dig their heels in” once in a while). Very playful, very friendly (both to other people and other dogs), the breed would make an excellent travel companion and is always up for travelling with their human “pack.” They are fairly easily trained, but might need a firmer hand when that stubborn streak strikes. Overall, though, this dog makes a very loyal friend who is happy to go through life as a perpetual playful puppy (be sure to keep that in mind!). Health – With a fairly long lifespan of 11-14 years, the Australian Silky Terrier is a mostly healthy breed, but even the best of breeds are prone to certain diseases and conditions. Some common ailments seen are hip dysplasia and elbow dysplasia (almost all dog breeds need to keep an eye out for this), diabetes, epilepsy (usually inherited), and tracheal collapse (small dogs are especially prone to this; it is caused by a weakening of cartilage and can be treated medically with antibiotics, steroids, or with surgery). Daily play and exercise keeps most Australian Silky Terriers in a spry mood, happy and healthy. Grooming – Despite the name and the lovely, long coat, the breed is not overly fussy when it comes to grooming requirements. If not intended for the show ring, the coat can hang 5 or 6 inches, parted down the middle of the back. Of course, the coat is longer on show dogs, stopping just shy of the tops of the feet. For simple grooming, a good brushing every other day and a bath once a month should do fine to keep your pup in top form. Start grooming and handling as early as possible with your dog. Get them accustomed to the brush in their hair, the little doggie toothbrush, and especially the feeling of your hands on their feet. Be sure to use positive tones, praises, and little rewards to help them learn that this…grooming… is a good thing. Owners should also be vigilant with dental care, as small dogs can quickly develop problems here. Brushing every other day is recommended, but if you can brush daily, do it. Not only will you help avoid dental disease and decay, but your pal’s breath will definitely be more pleasant. Lastly, trim their nails at least once a month (if you can hear the click-click-click on the floor, the nails are too long), and check (with your eyes and nose) the ears weekly. Just wipe the outside with a cotton ball and a pH-balanced cleaner…don’t ever insert a swab or anything else into the ear. While performing your dog’s grooming, check for sores, bumps, rashes and other potential problems or signs of injury or infection. Your local breeder can provide you with other tips helpful instructions on grooming and caring for your furry friend. Negatives – By all accounts, if you are looking for a small, stout little dog, this breed is a strong contender. The only real drawbacks can be found with their occasional tendency to be slightly stubborn, the typical health problems of hip and leg dysplasia, and the necessity of a pretty consistent grooming schedule. In the scheme of things, though, the Australian Silky Terrier is about as low-maintenance as a terrier can get. Positives – The positives of the breed far outweigh any negatives. This is a sturdy breed, loyal, fun-loving, curious, and energetic, suitable for living in close quarters, and always up for travelling with their human pack. They are intelligent, readily trained, easy to get along with, and of course, beautiful! If you spend time with your little friend, take care of them, and love them, you will be rewarded with many, many years of smiles, laughs, snuggles, and tail-wags. Your love will be returned ten-fold, the way only a fiery, feisty terrier can do!